We got to spend some good quality time with my family. I have to say that I am happy I live in Utah, lol. My friend Lisa (crazy redhead, lol) and my sister Bren. Bren has the colorful shirt and blond hair. It was nice getting to spend some one on one time with my sisters and parents. I feel bad for them though because there is a lot going on around them. My sisters are helping my parents with doing things around the house and they are trying to make some extra money by doing cute bird houses and crafts for Christmas. I will include the link to their page for their things they are selling. There aren’t many opportunities to make a living in this small farming area that is by the border of Mexico, so they do the best they can under the circumstances. We got to spend a couple outings with my sister Bren. 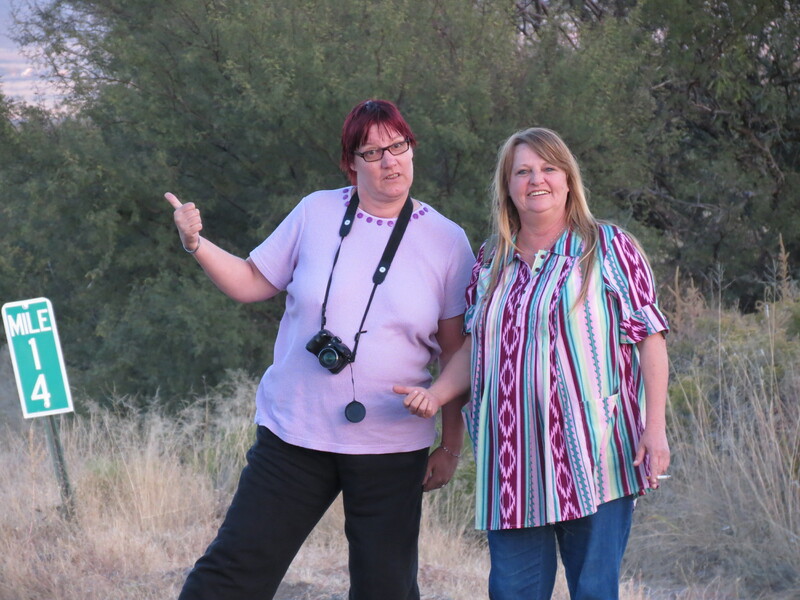 We went to Bisbee and Tombstone with her. She doesn’t get much of a chance to get out of the house since she has no transportation to go anywhere. It was nice getting to see her have a smile on her face and enjoying the time getting away. She has had a rough go of things. She had a blast just hanging out and doing normal things. When she is at home she helps my parents around the house and helps as she can. She did just have surgery and she is in my prayers that she has a speedy recovering and that she begins feeling better. This guy was pretty cool. Gene Lawrence is 74 yrs old and is known as Cowboy Gene Lawrence. 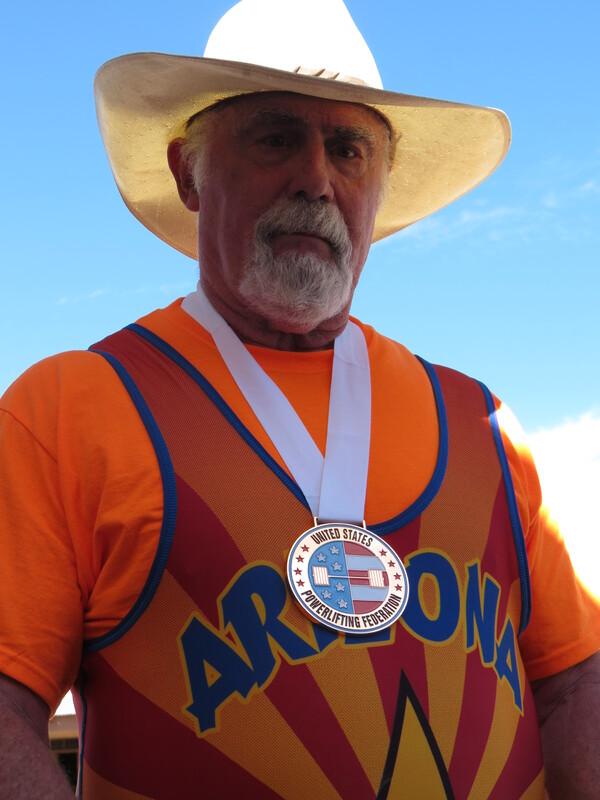 He is the most decorated Master Power lifter in Arizona. A three time world champion and holds dozens of world records. My sister Joyce, Lisa and I went to the church I will always consider my saving grace. That place is the Willcox Church of the Nazarene. I think for Joyce it was a way to look back and put things in the past and go on. I wish the church was closer so she could go. She seemed to enjoy it and the message was one she needed to hear. And that was on how Jesus died for us on Calvary and He loves us. We have our stains and sins, but we can be assured that Jesus loves us and will always be there for us. We drove past our old house and where my grandfather use to live. It is like Willcox stood still in time. I think for myself I have a problem with that because things and life are meant to progress, not be standing still. We are to move forward and not live in the past. And when I go there, everything is the same. Although I do love my little church and I wanted to take the alter home with me where I shed many tears during Weds night prayer meetings. Lisa said it wouldn’t fit in the car, lol. But I was taken back to some pretty difficult times in my life when I see the alter and I could see the place where I knelt at prayed. And my old pastor living in the same house and many tears shed around their dining room table. I will go more into this on another post. When sitting visiting with my parents, I did notice how time has caught up with them. Mom has a lot of pain and arthritis. She has trouble getting around. I would love to find someone that could go down there and help make the stairs to the front, back and my sister’s trailer safer. To me, it is an accident waiting to happen. Thanks to friends here I was able to take down some medical equipment for my mom and dad. My dad is having his share of medical and hearing problems. They are getting up there in age and are in their 70’s. But it’s not easy to see your parents having such a difficult time. I have to say that after going down there I am more than grateful for the life I have. I don’t think I could do what my sisters do there. For the help they offer mom and dad, I thank them from the bottom of my heart. I feel sad for them though at the same time. Because I love them and want them happy, I wish they could find some sort of peace and happiness. Everyone should be able to have the freedom to enjoy life and be happy. And I don’t sense that there is much there. I was very happy to see the changes in my sister when they got to get out of the house and go to breakfast or lunch without having to worry about a time to come back. Even though they may have wanted to get home earlier that didn’t happen, lol. My brother is also down there. I didn’t see him much. He would come out of his room every now and then, but other than that, he was there but not there. He does have this grumpy dog that snarls at his bedroom door. My parents have some dogs and so do my sisters. I thought I had a zoo, lol. They have cute dogs though. My friend Lisa brought back two of the cats my parents had. I will have to post pics of them. I think I will have to plan a trip down there again sooner than usual. With my parents getting older and it was nice to see that they were happy to see me and they were really nice to my friend Lisa.